Hi all, I discovered GroovyMAME and I have tried to configure it. I have a Pentium 4 with an ATI Radeon 9000. I installed CRT Emudriver 1.2 and copied GroovyMAME 0.182 and 0.183. I followed few tutorials, step by step, and I always get this message when I execute GroovyMAME: SwitchRes could not find a video mode that meets your specs. I looked for in the forum about it but solutions didn't workd for me. I'm desperated with it ;(. Thanks in advance. I tried it but it didn't work. But I reinstalled the driver and now I don't get this error. The problem now is I got an error about Direct3d: "Your graphics card does not suppoert non-power-of-two textures" and few more erros abour D3D. I changed video mode to OpenGL, but I got another error: "VBO and PBO not supported". Finally I change to GDI, aparently I don't get an error but it appears a black screen . I attached a txt trying to load King of Dragons. The problem now is I got an error about Direct3d: "Your graphics card does not suppoert non-power-of-two textures" and few more erros abour D3D. I changed video mode to OpenGL, but I got another error: "VBO and PBO not supported". Finally I change to GDI, aparently I don't get an error but it appears a black screen . As far as I know, GroovyMAME requires Direct3D (not OpenGL or GDI). The error message "Your graphics card does not suppoert non-power-of-two textures" is because core MAME doesn't support your video card anymore. I'm not sure exactly which version of MAME made that change (0.180 possibly) but I recall there are ways to remove the check if you're willing to compile your own EXE. Finally, it wouldn't hurt to install the full DirectX 9.0c redist package. Check this link. Around 95MB in size. IIRC Haynor666's build already contains the patch you need. Nobody gets things working right away the first time. Anyway, using 17-years old hardware makes things harder than average. krick's solution didn't work for me. Anyway, I tested Direct3D with dxdiag and it works, bit not groovymame. Calamity's solution: I downloaded groovymame32_207 but VMMaker.exe doesn't create .ini files for each game. I set GenerateInis = 1 and MameExe and IniPath paths are correct. The process stops showing this text: "Generating dynamic node table..."
I think I'm wasting my time and yours, I would like to ask you if there is a modern AMD graphic card that supports crt emudriver with a crt. His build has the change to allow older video cards. I'm 100% sure I downloaded Haynor's build from http://forum.arcadecontrols.com/index.php?topic=154799.0, (groovymame32_207.exe). When I execute it, I got this error again: "SwitchRes could not find a video mode that meets your specs". It happends because VMMaker.exe doesn't generate .ini file per game and I configured VMMaker.ini well: correct paths and GenerateIni = 1. I'm using a modified Windows XP called RetrOS. I watched a Youtube video where he install EmuDriver CRT and Groovymame with this modified Windows. Thanks for your time, I appreciate it so much. You can't extract the xml from modern MAME using the ancient tools in CRT Emudriver 1.2. This xml format has changed in the last years so you need the updated VMMaker app. Download the latest CRT Tools 2.0 standalone package (not the Emudriver) from the CRT Emudriver 2.0 download page, and use it instead of the old one. - First one: My PC is a Pentium 4 2,4GHz, 512 MB RAM and ATI Radeon 9000 128M. Windows XP RetrOS is installed. - I connect it to a VGA monitor and to a CRT at the same time. 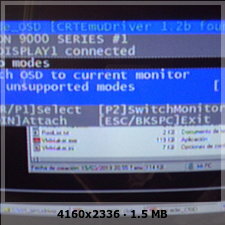 - I install Emudriver CRT 1.2b and I reboot. - First problem, VGA monitor shows well the image, CRT not, then I use Arcade_OSD from CRT Emudriver Tools 2.0, but it doesn't work because needs a library. I execute Arcade_OSD from CRT Emudriver Tools 1.2b and I change 640 480 Hz ...... KHz ...... native to 800 600 Hz ...... KHz ...... native. Now my CRT works very well but my monitor shows image moving like a wave. I switch off my PC and disconnect my VGA monitor. - I create ini folder in my groovyMAME folder, and inside of it I create source folder. - I execute VMMaker.exe from CRT Emudriver Tools 2.0, I click on MAME Tab and I configure it: "check export monitor settings to groovyMAME, get video modes from MAME XML and generate XML from MAME executable", I press OK and Generate modes, and when it finishes I install modes. - I execute groovyMAME from CMD: groovymame32_207 C:\groovymame\roms\kod.zip and I got the error: "SwitchRes could not find a video mode that meets your specs". I take a look to ini folder and it's empty. - I change mame.ini, I go to video and change auto to direct3d, but I got the same error. I am beginning to think that it is not possible to use GroovyMAME with my Pleistocene PC (or maybe it is that I am clumsy, I am very frustrated because I am a computer engineer and I am not able to make this work). Sorry for writing this bible. Post a log (check my signature). I'll tell you what to do. GroovyMAME doesn't require inis. The ini folder will be empty. Your confusion comes from the video tutorial you're following I guess. I attached 3 files, all are parent ROMs from 0.207 romset: Bubble Bobble, Caveman Ninja and King of Dragons. I see a black screen when I execute this command. Ok, for some reason your video card reports no available video modes. When you launch Arcade OSD, do you see any custom modes installed? Which display number does it show? (e.g. \\.\DISPLAY1, \\.\DISPLAY2, etc.). I only can see 2 custom modes installed, and the display I see is \\.\DISPLAY1. Once, I could see more custom video modes, but I don't know how I achieved it. Indeed, you have no custom modes available. Please use CRT Tools 2.0 for this. Download the package again, unzip it and launch VMMaker (I just want to make sure you start from scratch). Once in VMMaker, press "Generate Modes", then "Install Modes". Don't do anything else, like entering MAME setup tab or anything, do only what I said. Exit VMMaker. If possible, paste here the log.txt file you'll find in the folder after running VMMaker. Now restart and launch Arcade OSD. You should now have some custom modes in there. Open cmd and run dxdiag. Check if direct3d acceleration is enabled. ahhh, sorry, my bad. The problem comes with Arcade_OSD, not with VMMaker. Sorry. Arcade_OSD needs this library. I executed dxdiag, and... it's strange... Direct3D is disabled. Before formatting my HDD I tested it and it was enable, but its disabled right now. There it is. This is caused by a bad driver installation. XP driver handling was always crap. I've gone through this many times. You'll need to wipe your ATI software completely and try installing the driver again. Sometimes you need to go into safe mode to remove all drivers. If your XP copy had some bundled ATI drivers, you may need to get rid of them. Once XP can no longer recognize your video card, chances are it's free of previous ATI drivers and you can safely install CRT Emudriver. It may take several iterations until it works. Note that they are using a modified Windows XP called RetrOS. So that could be causing problems. I'm having trouble finding any documentation in English that explains what they've done to it to make it "RetrOS". 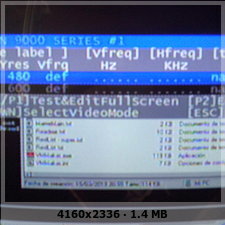 Hi, I resintalled Windows XP, this time with an original copy, no modified like RetrOS. I installed the driver without problems, I installed video modes with VMMaker without problem, now I can see more video modes than before with Arcade_OSD, and Direct3D is enabled and I tested it with dxdiag. The problem now is when I execute a rom, for example, Bubble Bobble, I get an error about Direct3D when is enabled. A log file is attached. PD: when I execute the command for making the log file I get a blue screen. Any idea or it's a lost battle? Can you tell me a little more about your motherboard brand and model? Is your video card AGP? After installing Windows XP, did you install the required motherboard chipset drivers? When you look in Windows Device Manager, do you see any "unknown device" in the list? Does your CPU have adequate cooling? Are you overclocking the CPU? The P4 is a small furnace and it requires substantial cooling. Also thermal paste can dry out when it gets old, so it may be worth checking and applying new paste. Is it possible the power supply could be bad? A lot of electronics from around that time had faulty capacitors and this can lead to blue screens. - Can you tell me a little more about your motherboard brand and model? - Is your video card AGP? My video card is an AGP. - After installing Windows XP, did you install the required motherboard chipset drivers? I didn't installed chipset drivers, and them can't be found. - When you look in Windows Device Manager, do you see any "unknown device" in the list? - Does your CPU have adequate cooling? Yes, even I added aditional fans. - Are you overclocking the CPU? The P4 is a small furnace and it requires substantial cooling. - Also thermal paste can dry out when it gets old, so it may be worth checking and applying new paste. I will do it, but CPU is enough cold, 30ºC doing nothing, over 40ºC working. - Is it possible the power supply could be bad? A lot of electronics from around that time had faulty capacitors and this can lead to blue screens. I have taken a look to the capacitors and all are ok, they are not swollen. I don't know if power supply is ok or not, but I have used this PC for playing MAME and with other emulators and I didn't get any problem with bluescreens. After you installed XP, did you try re-installing DirectX using the link I posted earlier? Yes, I'm absolutely sure I installed DirectX 9.0c. I reinstalled it again and I got the same issue again. I think blue screen is the problem and I can't capture it because it disappears quickly and Windows doesn't report anything later. I tried changing resolution to 384:240 59,60 Hz and my screen becames black. This battle is lost for me. Thanks so much to Krick and to my compatriot Calamity for spending your time on me. I don't usually surrender making this stuffs but I'm absolutely sure it's impossible making run groovymame on my PC. I'm going to start to look for a more modern PC with an AMD Radeon HD 5000 series as you said. Muchas gracias de corazón y con toda mi sinceridad. Blue screens are a tough one to sort out. 80% of the time, they're caused by a driver issue. The other 20% is flaky hardware. Page created in 0.21 seconds with 51 queries.